of mating calls can be heard throughout Virginia. I don’t care what the calendar says, here in the western Piedmont, spring begins March 1. This year, however, the winter was cold, dry, and windy, and seemed like endless. Then, miraculously, substantial rains and lingering warm spells came as February turned into March. Up here on a dry mountain ridge, however, I’d seen and heard few signs of spring—no wildflowers, no Spring Peepers, no Eastern Phoebes, or even American Woodcocks. A couple of Titmice did carry off some of my dog’s hair that I’d left on the deck for the birds to line their nests with, nonnative bulbs that were planted on the property were coming up, and I’d even heard reports of woodcocks finally starting their courtship beeping up in Shenandoah National Park, but not a peeper or a beeper here. The first real sign of spring at my house was around the first of March when I was working on my computer late one night and caught movement out of the corner of my eye. A dozen small moths were beating against the glass of the sliding-glass door next to me, trying to get to the light coming from the lamp on the inside. I was thrilled to see these insects so late at night that early in the month, signaling a break in the plunging temps that had come all winter as the sun went down. As much as I enjoyed seeing them, however, I quickly drew the blinds and turned off the lamp to keep them from wearing themselves out beating futilely against the glass. 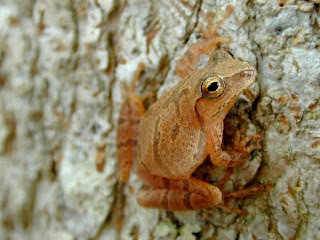 Reports of hearing Wood Frogs and Spring Peepers had started to come in from other nature observers at the end of February, but I didn’t hear these early-emerging frogs myself until the second week of March. I was driving a quiet gravel road through a low, wet area on a warmish, damp night when the a Peeper chorus crept in over the sound of the radio. I immediately turned off the radio, rolled down the windows, and stopped the car. I’d longed to hear that sound for so many cold, silent nights that I wanted to savor it. By that weekend I was itching to really experience spring, so I set out to find it where it was most likely to be—in low wet areas in the county. and Blue Ridge in early spring. I started along the Rappahannock River on that beautiful springlike Saturday but didn’t see much other than swarms of midges and other insects. I was disappointed in not even finding skunk cabbage, which normally blooms in February or March. I’d heard of some sightings of its flowering but couldn’t find the distinctive but subtly colored (some would say ugly) blooms in the damper areas along the river. Lots of Autumn Olive, that pernicious foreign invader, was leafing out faster than any of our native shrubs all along the trail, but no flowers of any sort in sight. It was still a gorgeous day, and later as I sat on a high hill in the still-bare forest with a friend and my dog, notes from Copland’s “Appalachian Spring” were running through my head. 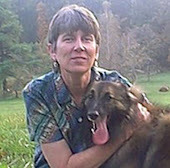 Green or not, spring was in the air in the Blue Ridge Mountain foothills. On the drive home at dusk, insects kept appearing in my headlights and then two bats appeared against the darkening sky, taking advantage of the buffet. Now that was more what I was looking for. When I got home, Spring Peepers were finally chorusing from a wetland on the other side of the road, a happy end to a fine day. making it through a cold, hard winter. On Sunday—still warm and sunny—a walk along the Thornton River was not very productive in terms of spotting signs of spring, so I went to the Hazel River. 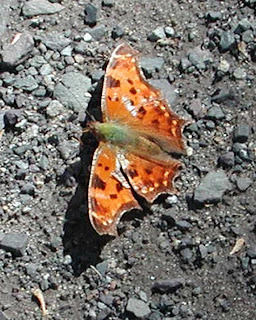 There I felt like I hit the spring jackpot: one Eastern Comma butterfly, then another, on the gravel road leading along the river. The two briefly chased each other, but both seemed more interested in ingesting the minerals on the gravel road. I finally got close enough to take a few quick photos of one, which was so battered that I had to look closely to make sure it was indeed an Eastern Comma (Polygonia comma) and not the similar Question Mark (Polygonia interrogationis). I hadn’t seen any migratory songbirds in my weekend rambles. Then again, I started in the afternoon and was more focused on trying to find flowering plants that might respond to the warmth at that hour and show off their blooms. Reports of migratory-bird sightings have been filtering in since early March from over in Shenandoah Valley by a birding group there: Tree Swallows, Pine Siskins, Yellow-Rumped Warblers, Golden-Crowned Kinglets, Pine Warblers, and Cedar Waxwings. Although I haven’t seen or heard my pair of Eastern Phoebes, that species had also been spotted. 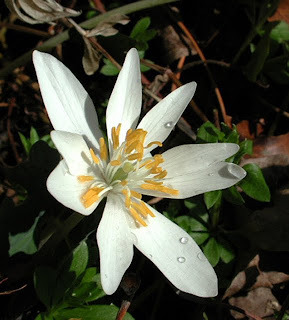 Bloodroot, also an early spring bloomer. By the time this column is printed, early-flowering native wildflowers should be well along with their displays. A walk in natural areas should yield sights of Bloodroot, Toothwort, Liverwort, Dog-tooth Violet, Coltsfoot, Dandelion, Spring Beauty, Storksbill, Common Blue Violet, Rue Anemone, Trailing Arbutus, Star Chickweed, Plantain-leaved Pussytoes, Trout Lily, Round-lobed Hepatica, and Pink Azalea in bloom.